lmharnisch: Who Are Those Guys? 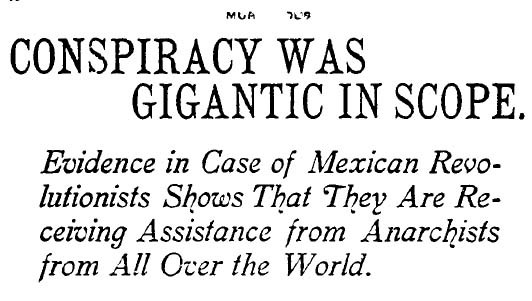 A shadowy, global conspiracy of anarchists is being described in the trial of revolutionaries Ricardo Flores Magon, Antonio Villareal and Librado Rivera in federal court. The fourth defendant, L. Gutierrez De Lara, was charged separately with committing larceny in Sonora, Mexico. “Arms, bombs and poison were the weapons to be used in invading Mexico.... The wily leaders expected to inflame their ignorant followers to acts of rapine and violence such as characterized the French revolution. For the furtherance of this infamous plot, thousands of dollars has been raised and expended by the leaders,” The Times said. 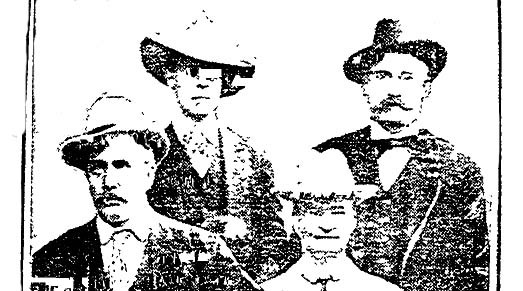 Shown above, the Arizona lawmen who helped capture the revolutionaries: from left, Capt. F.H. Rynning, Undersheriff A.A. Hopkins, Lt. Billy Old and U.S. Inspector C.T. Connell. 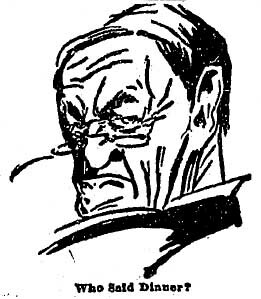 One of the key witnesses in the trial will be A.T. Samuels of the Furlong Secret Service Bureau, who worked undercover selling ads for the revolutionists’ newspaper in St. Louis. After several speeches, defense attorney A.R. Holston “devoted most of his harangue to an attack upon The Times. He was very much surprised, he said, that this paper had called the former meeting [anarchistic] in character when it had been praised by the Citizen (Labor-Union), by the Common Sense (Socialist) and by the Express. Bonus facts: Job Harriman was one of the defense attorneys for the McNamaras in the 1910 bombing of The Times and in 1914 founded a Socialist colony named Llano del Rio in the Antelope Valley, just beyond Pearblossom on the road between Palmdale and Victorville. He died in that hotbed of radicalism, Sierra Madre, in 1925 and was buried at Forest Lawn in Glendale.